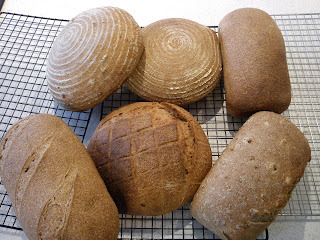 Jo's Loaves: Are These The Loaves of Shapes to Come?? Are These The Loaves of Shapes to Come?? I am currently experimenting with free-form loaves. My oven has the capacity to take 12 loaves in one go, just as long as they are in a medium tin. It's not ideal and I think any baker worth his salt would throw their arms in the air in despair. The advantages of baking loaves in tins, is that they are easy to slice for sandwiches or toast; not many people have 1 ft knives to carve through a whopping circular jobbie. But I can't help thinking that expanding into the realms of boules, batons, and batards will give me a) more credibility b) less hassle with fiddling about with tins and grease and reduce the stress at turn-out time - it's stuck, nnnnoooooo!! Of course, my oven will only take 6 (and it's risky!) shapes in one bake, which is totally impractical. So with a bit of help, I plan to make two major purchases of a proper bread oven and a mixer to help with all the extra bread I plan to sell. "£2.50 a loaf??? Even Bettys don't charge that much"
"Call yourself an artisan baker and you too can charge such rip off prices." "£2.50!!!? You're 'aving a loaf! That's a lot of dough!" "£2.50 for a loaf made with quality flour in the traditional way is very reasonable. Good bread is very rare to come by and the alternatives on offer at supermarkets, which are masquerading as 'healthy food' rarely have any real nutritional value. The breads which Mr. Kippax is offering are made with ingredients which are both easy to digest and especially in the case of wholegrain and seeded versions, are very healthy. The mass-produced breads are mostly leeched of any nutrients owing to the ingredients and methods used. So, taking this into perspective, £2.50 is a snip. Anyone who is reluctant to pay this for this kind of product really doesn't put much value on their wellbeing. I'll bet they would happily part with this for a pint of beer or lager or a packet of 10 cigarettes." 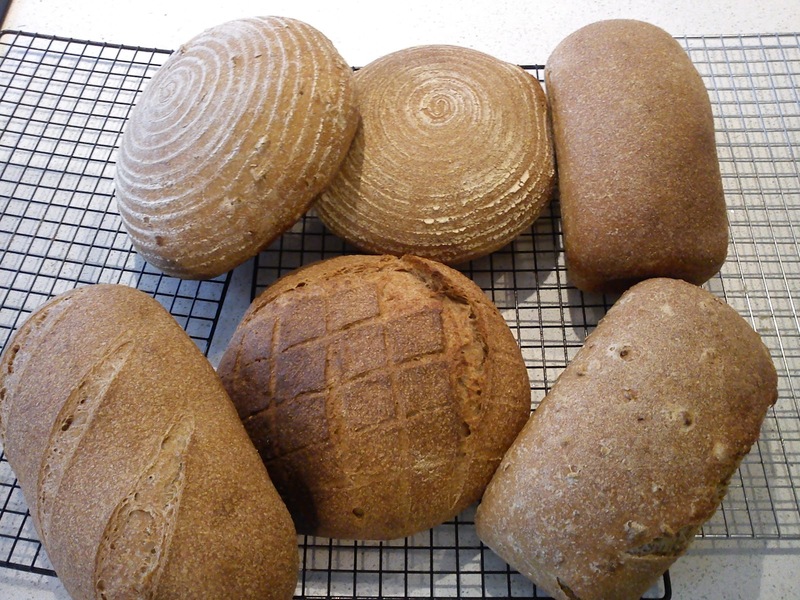 Friday, 9th March - NO ORDERS but hope to have between 60 and 80 loaves for sale (gulp) at the Kings Walden Farmers Market - 11am until 2pm, follow the signs, I would love your support if you can make it even if you don't buy anything!! THERE WILL BE NO BAKE for Saturday, 10th March as I will be in bed. Normal Tuesday, Thursday and Saturday services resumed w/c 12th March.